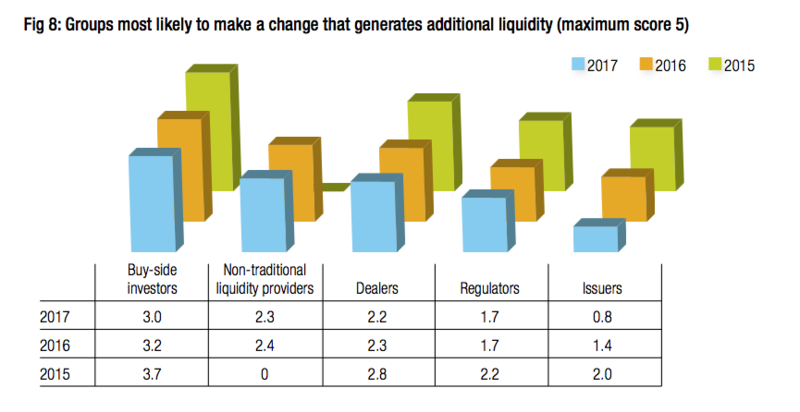 The range of credit liquidity aggregation platforms used has increased, reducing demand for new connections. 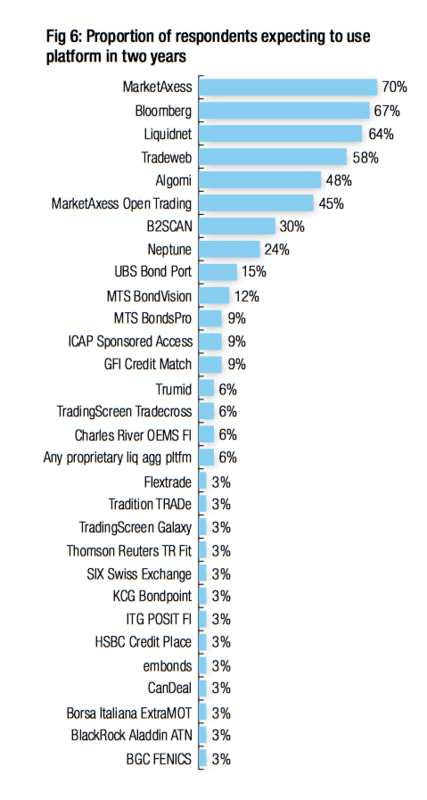 The DESK’s Trading Intentions Survey is global primary research identifying which liquidity aggregation platforms are being used to trade corporate bonds. In 2017, 34 buy-side firms with a combined E14.2 trillion assets under management took part, representing 23 US credit trading desks, 29 European credit trading desks and 19 emerging markets credit trading desks. More traders than ever rank themselves as ‘major’ users of platforms, with the number of platforms being employed growing year-on-year. This creates a tension between the winners which are emerging, and the new platforms launching and gaining market share. While we see some platforms consolidating already, the pipeline of traders expecting to move onto new trading and pre-trade data systems is greatest for newer systems. Some reduction in planned activity for onboarding new platforms may be due to external factors. Regulation has occupied buy-side trading desks in Q1, with firms getting prepped for variation margin up to 1 March 2017 and for the new Market in Financial Instruments Directive (MiFID II) in January 2018. 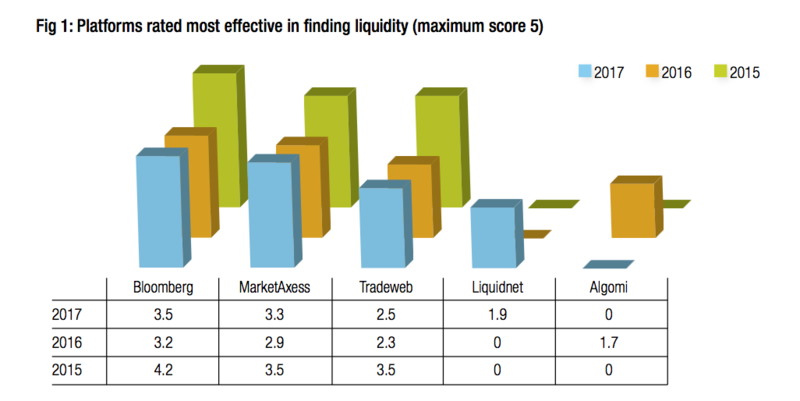 For liquidity aggregation platforms the trend towards growth has broadly continued across the major players. For some the success in 2016 has calmed. 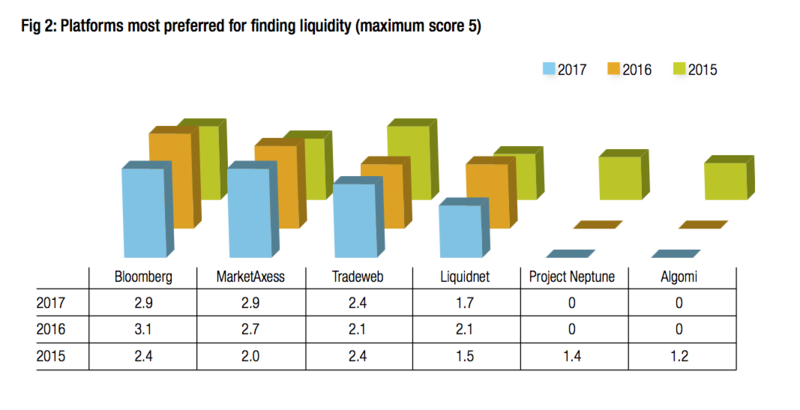 The platforms voted most effective for finding liquidity – Bloomberg, MarketAxess and Tradeweb – have all increased their scores (on a scale of 1-5), with Liquidnet now joining the pack as an effective tool source (Fig 1). Liquidnet and Bloomberg have seen a slight drop off in voting as ‘preferred’ platforms on which to find liquidity despite their reported increase in effectiveness (Fig 2). Both Neptune and Algomi are still cited in this category but no longer highly enough to rank amongst the top firms. MarketAxess and Tradeweb, by contrast, have seen their ‘preferred’ status grow over the last year. Traders reporting they are ‘major users’ of several platforms has continued to show a growth trend, suggesting some are beginning to focus their work on certain platforms (Fig 3). Of note, Bloomberg appears to have experienced a boost in concentrated users, as has Liquidnet, albeit from a smaller base. MarketAxess has seen growth by major users continue at a slightly slower pace, while Tradeweb saw a fall in traders reporting as major users. The real newcomer has been the proprietary platform. As noted in our feature ‘Making prices more easily’ many buy-side firms are now building proprietary tools to determine price and liquidity pre-trade, to fulfil functions as a price maker, to support best execution and to support portfolio management. For 12% of firms to describe themselves as major users of these tools suggests that where they are built, they are being used to great effect. Non-proprietary information platforms – Algomi, B2Scan and the Neptune FIX messaging system – have also all gained more a dedicated following this year. Charles River’s Fixed Income Workstation, which was added to the list by traders last year, has clearly taken on a major role for some firms. The proportion of traders considering themselves more broadly as ‘users’ of each platform has changed noticeably (Fig 4). Liquidnet has nearly doubled the proportion of users from 29% to 56% of respondents, while Tradeweb has stabilised its general user base, indicating traders are changing the way they use the platform. 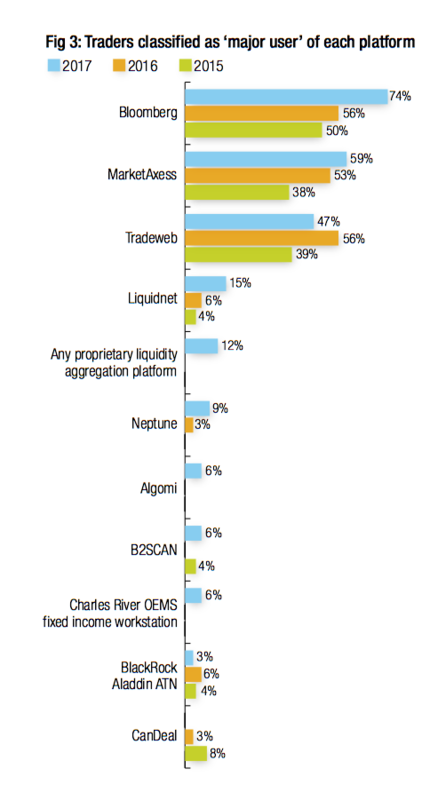 Pre-trade liquidity data platforms Algomi and B2Scan have both continued their rise. Algomi’s growth is slowing, but should be measured against a real leap in 2016. Trumid, SGX Bonds Pro and TradingScreen all show continued growth. Bloomberg, HSBC Credit Place, Canadian specialist platform CanDeal, emerging markets specialist Liquidity Finance, MarketAxess, Euronext Bondmatch and UBS Bond Port have all seen drop-offs from the previous year. In context, the decline in users across Bloomberg and MarketAxess is offset by their growth in the major users’ data, suggesting a change in use rather than decline in use, while BondPort had accelerated so rapidly in 2016, moving from 4% of users to 41% in a single year, that sustaining that growth would have been an Herculean task. As a group, BGC/GFI deserves a mention in dispatches, as the firm’s three platforms capture nearly 10% of respondents as users, but do not constitute a single platform thereby keeping them off the chart. In total, 32 platforms have ‘users’ and/or ‘major users’ amongst the 34 buy-side firms that responded, up from 28 platforms in 2016 and 19 in 2015. That suggests fragmentation is far from over, despite increased concentration of use. The research has shown a correlation between the increases in users/major users of a given platform and the decline in the pipeline of traders who plan to move onto that platform (Fig 5). An extreme example is Bloomberg, with 74% of traders declaring themselves ‘major users’, and 26% as ‘users’, no-one plans to move on to Bloomberg, because they are already there. Likewise many newcomers are the cause of the adoption pipeline tailing off as a result of successful adoption. One incumbent to show growth potential is MarketAxess, whose Open Trading platform was cited as a cause for potentially increasing use. 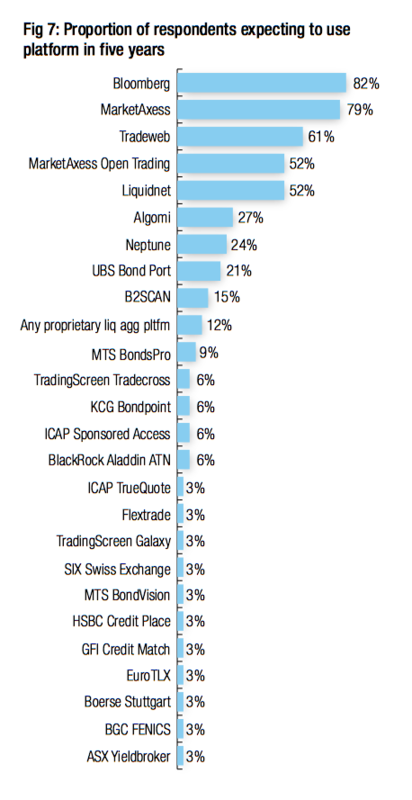 TradingScreen Tradecross and KCG Bondpoint will be amongst the platforms to watch next year, showing a strong and growing onboarding pipeline. Looking ahead at the Two- and Five-Year predictions of use, we see the confidence that traders have in platforms (Figs 6 & 7). Due to some inconsistency in the way these questions are answered by participants, these two charts should only be seen as loose guide when compared with Figures 1 to 5, which receive a consistent response and outlook. Noticeable inclusions are the MTS platforms which have the confidence of 21% of respondents in the medium term and 12% over the five-year period, which suggests a strong onboarding pipeline. Equally the ICAP platforms – TrueQuote which launched in March 2016 and ISAM which is yet to launch – take 9% over the two- and five-year period, which is positive sentiment for platforms still in their early stages. The research reflects the maturity of the market. New platforms are launching, incumbents have largely responded positively, and some new ideas have clearly taken root. Initial hesitancy has been overcome by platforms with a strong message and clearly defined offering. 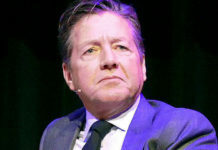 Likewise, consolidation is already in progress – Trumid is hoping to take over rival Electronifie this year – and tie-ups between pre-trade liquidity aggregators and market operators – B2Scan and MTS / Algomi and Euronext – are showing some smart thinking as well given the commercial pressure that firms are facing. There are a few interesting cases in the data. BlackRock’s Aladdin ATN has consistently rated as highly used by a small group of firms, yet it has not widened its user base across respondents. That suggests any restriction is not based on its functionality. Execution/Order Management System (E/OMS) providers have been increasingly mentioned by traders for inclusion, indicating that some would rather the connectivity to platforms was handled by their E/OMS providers. More than one respondent has noted that messaging protocols such as Neptune are ‘plumbing’ that should be dealt with away from the trading desk, however that is by no means a consensus view. Finally, perception that any group can affect market liquidity has shown an overall decline in expectations, bar one (Fig 8). In the view of respondents, regulators have maintained a consistent capacity to affect liquidity over 2016 and 2017. Yet most still see the buy-side trading desk as having most impact.